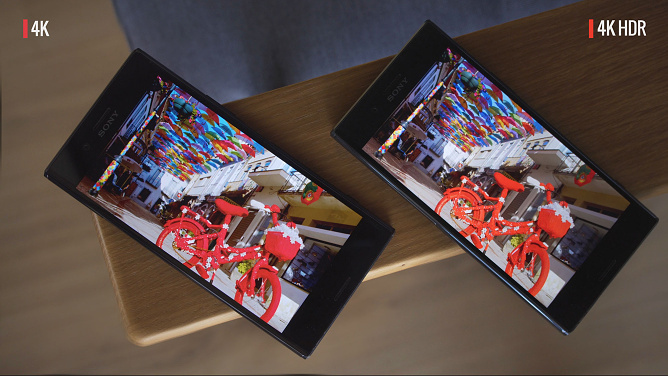 The Sony Xperia Z5 Premium was the first phone to come with a 4K display. Now, the Xperia XZ Premium is adding HDR video support. Unlike the ultra high resolution, which had its pros and cons, HDR has no shortcomings - highlights and shadows are rendered better, gradients are smoother, colors are richer. Below you will see a comparative shot of how the 4K HDR and the 4K SDR video looks on the screen of the XZ Premium. Before you jump to quick conclusions, bear in mind that this comparison has an illustrative purpose only - the only way to appreciate an HDR video playing on an HDR-capable screen is in person with your own eyes. Everything else is an approximation and the end result will more or less be affected by the camera settings we used and your own computer screen. Our entire point however is that both the 4K SDR and HDR videos, which we used, looked perfectly good in real life and you can't really tell any difference between the two unless you have them side by side. 4K resolution on a small screen is not without its benefits, too, take virtual reality, for instance. Sony however still hasn't found a way to put the insanely high resolution on that screen to good use in VR. None of the current VR headsets have enough resolution, especially the mobile units. With a 4K screen and a powerful GPU (courtesy of Qualcomm), the Sony Xperia XZ Premium is perfectly poised to rule the mobile VR market but we guess the PlayStation division did not want any sibling rivalry. At the normal distance that we use our phone, 4K resolution on the Xperia XZ Premium seems like an overkill simply because your eyes can't really tell the difference compared to the QHD resolution, which we've seen on most high-end phones. In this case, however, it does not affect the performance as the phone runs in 1080p mode most of the time. That's until you feed it with quality 4K footage where it really starts making use of all the pixels. A side benefit from that screen is that YouTube will now offer you 4K quality setting on the Xperia XZ Premium. There is no HDR support for YouTube, but even 4K on its own is good enough by our books. HDR video content is still scarce but subscription video streaming services such as Amazon and Netflix are already offering HDR content, so you should be able to find some high-quality material to feast your eyes on right out of the box. Sony Xperia XZ Premium's screen is HDR10 compliant, which is another way of saying that there is no Dolby Vision support - these two HDR video standards are the most popular right now. The phone also offers Adaptive Tone Mapping to ensure the bright screen contents don't get clipped when the screen brightness goes up in bright ambient light. Sony has the same feature on its BRAVIA TVs. As usual, we looked at the screen under a microscope and it revealed the same RGB pixel arrangement we saw on the Xperia Z5 Premium. Even at the maximum magnification that our microscope allows, the individual pixels are just barely visible - the screen is that pixel-dense! The maximum brightness of the screen (573nits) turned out quite in line with what we got from the Xperia Z5 Premium (566nits). The level of blacks is deeper, though, which works out to a much better contrast ratio of 1238:1, as opposed to the Z5's 963:1. In terms of sunlight legibility, the XZ Premium brings improvements over the Z5 Premium yet again. Both get decent scores, and while there is still a lot of room for improvement, the XZ Premium is better suited for use outdoors. The relatively high reflectivity of both screens limits their practicality in this respect. The Sony Xperia XZ Premium does not only improve the 4K display in terms of contrast and HDR video support, but it also comes with an sRGB color mode. The feature caters to professionals who would need accurate color reproduction and it's not turned on by default. The sRGB mode scored an average DeltaE of 4.9 in our color reproduction test, which is decent but not ideal. Even though the screen indeed complied to the sRGB color space (unlike the regular mode), there is a noticeable bluish tint in the white and gray hues. The Normal display mode exceeds the sRGB color space and even though it produced more juicy colors, it still provided an average DeltaE of 4.6, which is better than the sRGB mode. The whites and grays still have a noticeable bluish tint though. There is also a Vivid screen mode, which would over-saturate pretty much every color. Previously, the Triluminos screen enhancement only worked in the Albums and Movies app but on the Xperia XZ Premium, it's also applicable to the homescreen and 3rd party apps. You can't turn it on or off, it's a built-in enhancement, which is part of the Normal screen mode. Sony additionally offers the X-reality for Mobile engine, which only works on videos and makes them perceivably sharper by improving clarity on the fly as the video plays back on the phone. This feature, however, you can toggle either on or off. The Xperia XZ Premium relies on a 3,230mAh battery to keep it powered, 200mah down from the Xperia Z5 Premium. The phone is Quick Charge 3.0 enabled and will fill a depleted battery up to 42% in 30 mins. However, the Premium does not ship with a QC-compatible charger, you should pay some premium for that, pun intended. In our tests the Xperia XZ Premium proved to be very good at voice calls and an otherwise balanced performer in the other disciplines. Web browsing over Wi-Fi depletes the Xperia XZ Premium battery in just over 10 hours. In looping our test video until the battery is down to 10%, the Xperia XZ lasts for north of 8 hours, which is a very good endurance but it trails behind the flagship competition. Coupled with frugal standby power consumption, the above numbers add up to a combined endurance rating of 72 hours. Our endurance rating denotes how long a single battery charge will last you if you use the Xperia XZ Premium for an hour each of telephony, web browsing, and video playback daily. We've established this usage pattern so our battery results are comparable across devices in the most common day-to-day tasks. The battery testing procedure is described in detail in case you're interested in the nitty-gritties. You can also check out our complete battery test table, where you can see how all of the smartphones we've tested will compare under your own typical use. The Qnovo Adaptive Charging tech built inside recent Sony Xperia phones allows the smartphone to monitor the cell's electrochemical processes in real time and adjust charging parameters dynamically to minimize cell damage and extend the battery unit's lifespan. Qnovo claims the battery should last hundreds of charge cycles more than a conventionally charged battery. This potentially means a year or so of extra longevity as the battery performance should hopefully deteriorate more slowly and should be able to hold more charge once it gets older. Battery Care is another proprietary Sony feature, which further increases the battery lifespan. It may not be available in every market, so you should explore that possibility before buying an Xperia XZ Premium. So what does Battery Care do? Say you charge your phone overnight, and you regularly plug it in at midnight and unplug it at 8 in the morning. In time, the phone will recognize the pattern, charge the battery to 90% and then stop charging. And then at, say, 7:30 in the morning it will pick up where it left off and top it all up to 100% at a slower pace. If it hasn't picked up your routine, it'll do a standard charge. The handset also supports the Qualcomm QuickCharge 3.0, but we're not sure if it will come bundled with a charger to match. As usual for Sony, this decision will most probably be a regional thing so check with your retailer of choice. We used QC3.0 charger with the XZ Premium and it charged 42% of the 3,200mAh battery in 30 mins which is not terribly fast but it's alright. On the software side of things, Sony has also baked in their prorprietary Stamina battery saving feature. It has two modes: regular Stamina, and Ultra Stamina. The first disables non-essential features like GPS and vibration, and takes performance down a notch. Ultra Stamina is for absolutely dire occasions when you don't expect to be able to find a power outlet for a long period of time. Enable that and it's back to basics where you get a single homescreen with access to the dialer and contacts, text messages, camera, clock - just the basics. Going out of Ultra Stamina requires a restart. The Xperia XZ Premium is well-stocked of connectivity options. Our review unit is the single-SIM variety (G8141 model name), but there's also a dual-SIM model (G8142) available. The SIM tray in that case takes two nano-SIM cards, while you can still use the dedicated microSD slot. LTE is Cat. 16 with impressive 1Gbps of download, courtesy of the latest Qualcomm modem with 3x carrier aggregation. The Xperia XZ Premium utilizes a 4x4MIMO antenna design and packs a total of 8 antennas, which improves the signal reception and allows the device to switch antennae depending on the phone's orientation. The Xperia XZ Premium also comes equipped with dual-band Wi-Fi a/b/g/n/ac with 2x2 MIMO antennas for speeds up to 867Mbps (if you have a compatible capable router). The local connectivity list goes on with Bluetooth 5 with aptX and Low Energy, and NFC. The Wi-Fi connection can be used for screen casting - be it Miracast, Google Cast, or DLNA. If you connect a DualShock controller, the Xperia XZ Premium can even double as a portable console, streaming your Playstation 4 games via PS4 Remote Play. It can also connect to your car audio via MirrorLink. GPS, GLONASS, BeiDou and Galileo satellite positioning are supported, unless you're in the US, where it's just GPS and GLONASS. The Xperia XZ Premium has no FM radio. The USB port is Type-C with support for USB 3.1. It lets you hook up USB storage and accessories and charge other devices. Sony has dropped MHL support, so you have no wired means of image and video output. You do get a 3.5mm audio jack.